Advance notice of me reading some haiku – Tauranga Art Gallery, Thursday August 21, doors open 5.30pm for a 6pm start. I have baggsed the first spot after the interval as most of the others (5) will be reading longer poems and I wanted to give my little ones room to breathe. The event has been organised by the gallery to celebrate the “Black Rainbow” exhibition, which features some of Ralph Hotere‘s black paintings, as well as Michael Parekowhai‘s in-cred-ib-le red piano. Black Painting XV by Ralph Hotere. Image: Courtesy of Te Papa. 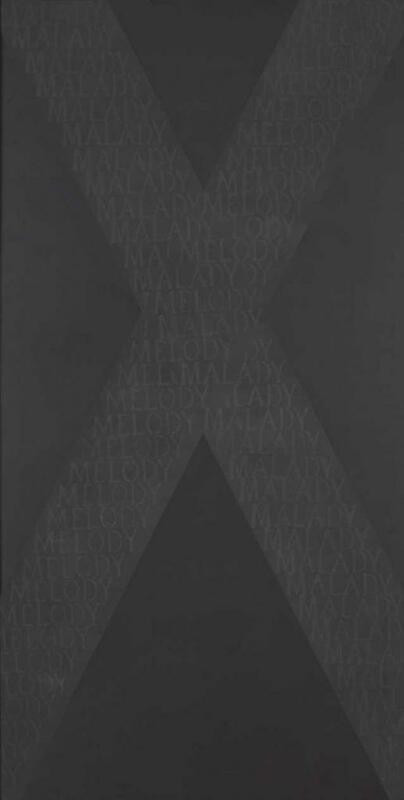 The painting features the words “malady” and “melody” taken from a poem by Bill Manhire. I thought a two-word painting behind me would lend power to my three-line haiku. 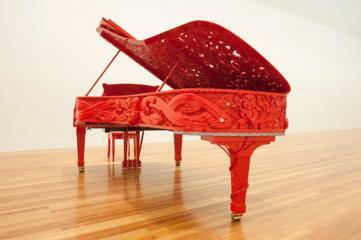 I wish I could find a better photo of the piano – He Korero Purakau mo Te Awanui o Te Motu: story of a New Zealand river – but all the other images I can see are copyrighted. Read about the piano’s $1.5 million purchase price here. It’s nice that Te Papa is prepared to share. The carving is exquisite (if I read the information correctly, designed by Parekowhai but not executed by him) and the lacquer finish makes it, well, sing!